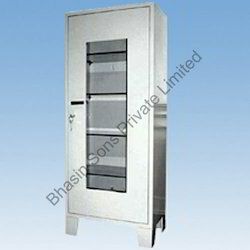 Exporter of a wide range of products which include instrument cabinet and hospital instrument cabinet. Backed by the sound state- of- art infrastructure, we offer Instrument Cabinet. We use sophisticated technology and machinery for the process of designing and constructing these stainless steel products. 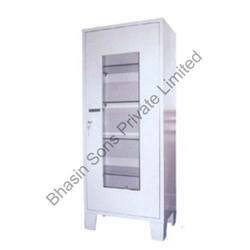 These products are used for storing pharmaceutical products and operation accessories. This product is featured with various shelves and also featured with lots of space. We design this product with utmost care along with attractive knobs for opening. Constructed form enamelled sheet steel. locking doors and removable sheet steel sheet steel shelf. Strictly following the research modules of our skilled professional, we are manufacturing and exporting Hospital Instrument Cabinet. These products are used for storing pharmaceutical products and operation accessories in the hospitals. This product is featured with different shelves with convenient space. We design this product with utmost care along with attractive knobs for opening. More over we use advanced technology for manufacturing to maintain its international qualities.